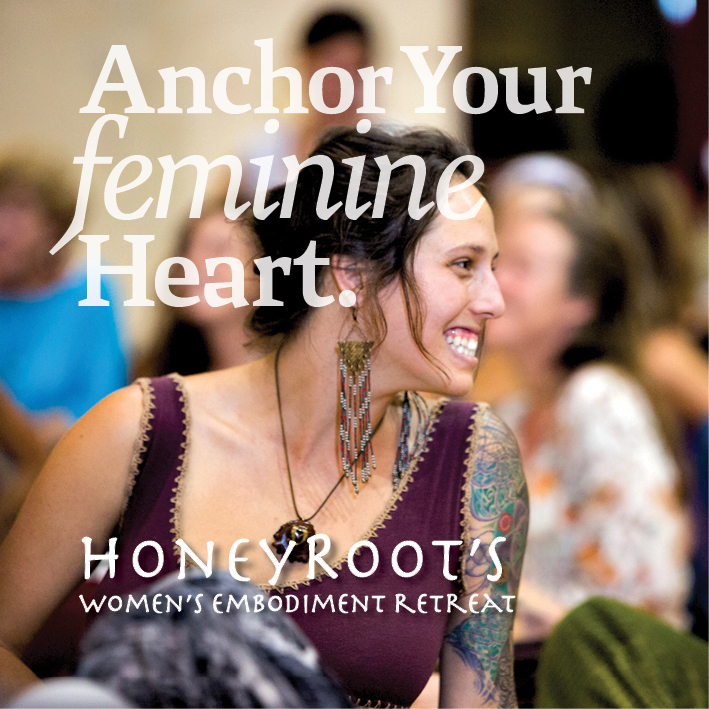 HoneyRoot visions a world where people have access to opportunities and tools that heal our bodies, deepen our emotional capacities, strengthen our communities, and value both feminine and masculine principles -- in balance, in action, across barriers, and as a home base. HoneyRoot knows that somatic intelligence is a resource that is not yet fully understood by the larger culture, a tool available to all, a healing force for our planet and our communities. We provide embodiment education designed to address and heal the ancient and contemporary wounds that have severed so many of us from the capacity to live at peace within our own bodies, within our world. 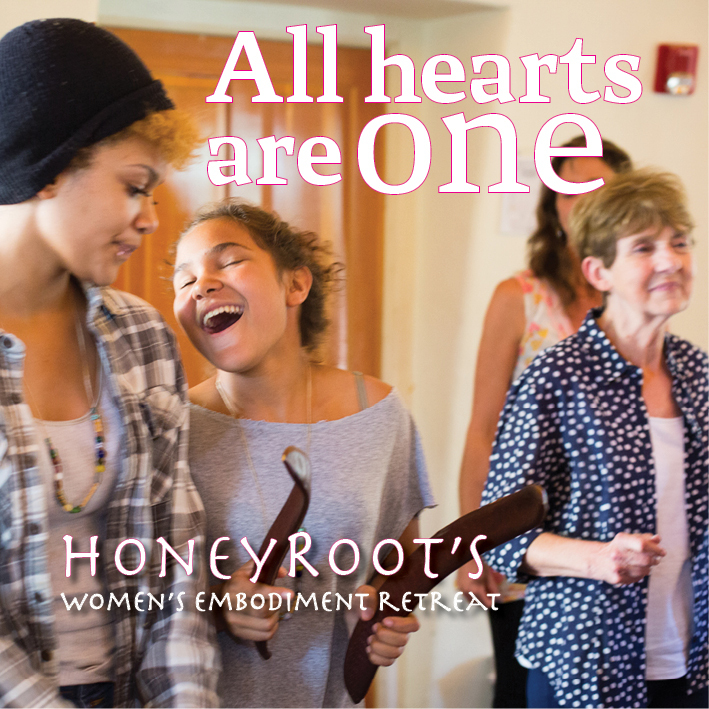 HoneyRoot is an educational institution, practice community and social service nonprofit based in the wisdom of body, emotionally-intelligent relating, and the cultivation of a compassionate, resilient social fabric. We provide an array of opportunities designed to help people embody the wisdom that lives in our bones, our nervous systems, hearts and relational capacities. 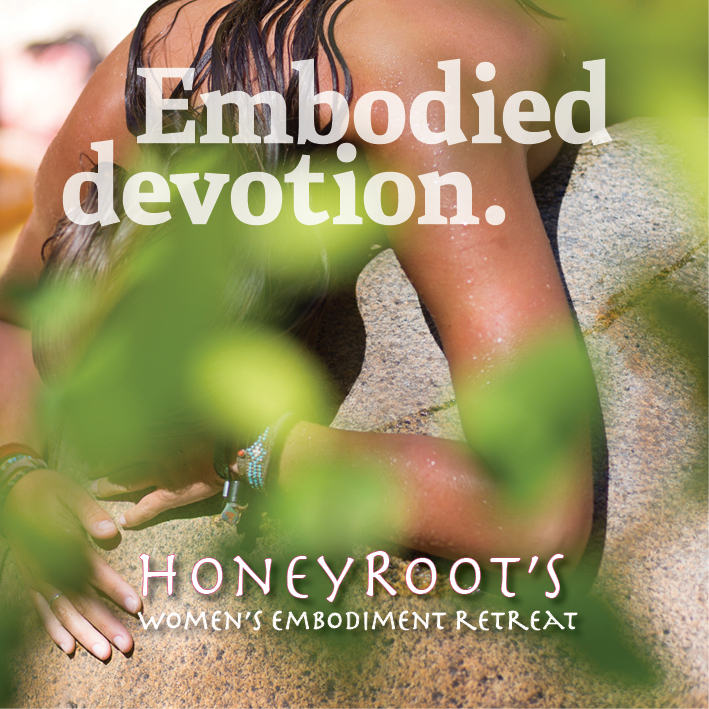 Through somatically and relationally-oriented events, in-body education, online courses, leadership trainings and community rituals, we create opportunities to inhabit our bodies, embolden our hearts, and include what has been excluded. We strive to be a home for full-spectrum living. When we bend our knees, release our jaws and pelvic muscles, rest into our weight, stay connected to our bellies, and bring attention to the constant support of the Earth, itself, we set up the potential to find ourselves and each other, with ease, grace, and an at-home-ness that is innately ours. As an organization rooted in education and practice, we know that the repetition of intelligent modalities grow our capacities to be present, responsive, and sincere. Embodied practice yields more depth, insight, courage and freedom than mental understanding, talk, or planning ever can. We also know that in order to have the impact that we desire, we must simultaneously dedicate ourselves to and continuously grow our capacity to create an intersectional community. With this as our guiding light, we explore the realities of our own privilege and intersecting oppressions in order to deepen our understanding of ourselves and others. We are dedicated to building greater awareness in ourselves and our community, and support our participants to do the same. We seek to use our privilege to amplify the voices of those who are not heard in the dominant culture, and provide those opportunities for our larger community. 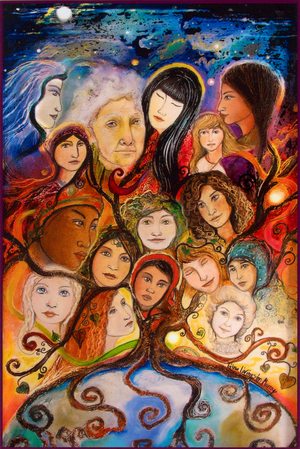 We honor the diversity of all beings, and stand in solidarity towards the goal of ending systems of oppression. We know that the deepest learning happens when both compassion and accountability are on board together. We value inward connection (knowing and feeling) as a ground and resource for outward activity (going and doing). We value connection and inclusivity. We cultivate greater awareness, sensitivity and social capacity as a way to break down the barriers that have kept us from finding ease of connection in our relations with others. We value individual growth alongside, and interwoven with, collective growth. We know the two are inseparable, and that a collective thrives when it acknowledges the uniqueness of its parts. We open our hearts to the many textures of experience within each of us. We practice tending to all parts of ourselves while staying connected to one another. We embrace our strengths and celebrate our unique capabilities, rather than bending to self-critique or blame that tells us we must be like others in order to belong. We value compassion, knowing demands and perfectionism are tools of systems of oppression. We acknowledge, respect and work with the physical and subtle body in a comprehensive way – from toe to head, from root to crown. We are proud of the breadth of our embodied expression – passion, creativity, emotion, intuition, empathy, presence, drive – and support one another in occupying all of these aspects. 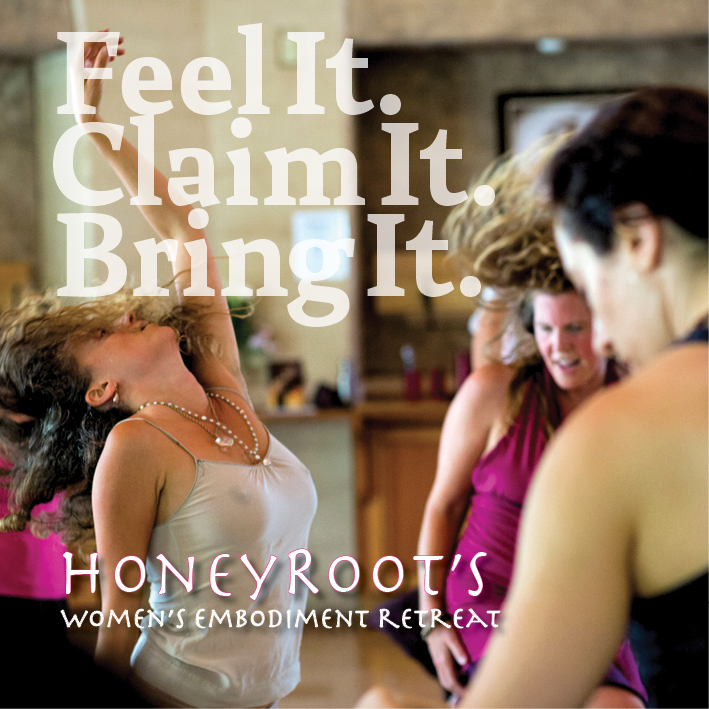 Through embodiment processes and community support we become the fullest and most potent expression of ourselves. 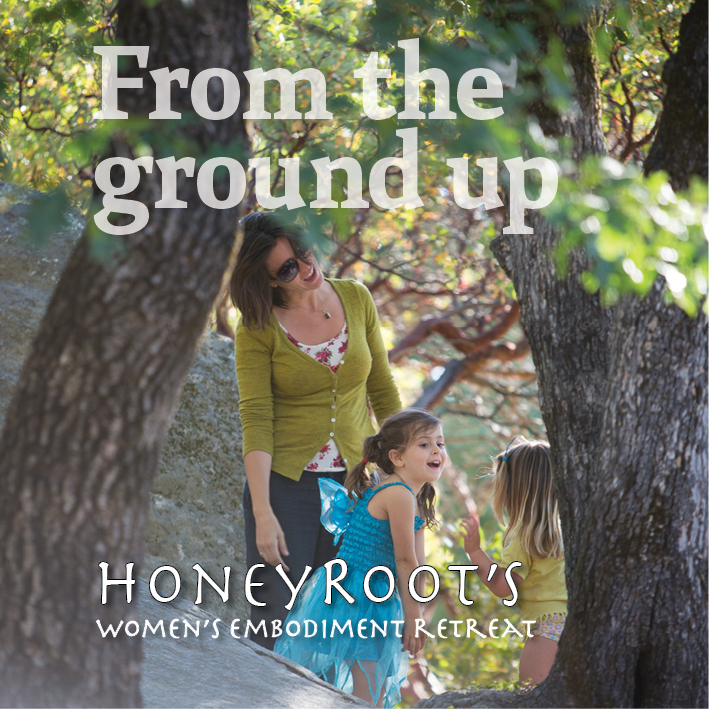 HoneyRoot organizers and facilitators create a strong container, a safe playground, and a loving womb for the revelation of our embodiment. We hope you’ll join us. When we bend our knees, release our jaws and pelvic muscles, rest into our weight, stay connected to our bellies, and bring attention to the constant support of Mother Earth, we set up the potential to find ourselves and one another with ease, grace, and an at-home-ness that is innately ours. "If you want to dance with another, root your self first. Learn to hear your own guidance. Dialogue with the hurt child and the divine host within. Practice forgiveness and compassion for yourself. Stay in the rhythm of life. Be open to others but do not go out of your way to find them. Those who know how to dance will meet you half way. It will not be a struggle. You will feel companionship without effort."